Home > Wheels & Tires Detailing > Carrand Brush & Shine Tire Dressing Applicators - 2 Pack > Wolfgang Black Diamond Tire Gel > Wolfgang Black Diamond Tire Gel 128 oz. Refill Free Bonus! Its best to allow 30 minutes for the gel to cure. You will enjoy a beautiful finish on your tires that lasts for weeks. 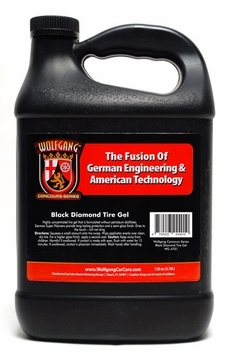 Wolfgang Black Diamond Tire Gel Gallon & 16 oz. Combo | Wolfgang Black Diamond Tire Gel 128 oz. Refill Free Bonus!